I traveled to Abuja, Nigeria in December of 2010 to work in a facility that treats over 7,000 underserved patients annually. There, I spent most of my time in the inpatient pediatric ward, as well as the NICU. In the pediatric ward, I took direct care of patients afflicted with severe malnutrition, end stage HIV/AIDS, as well as severe sepsis. 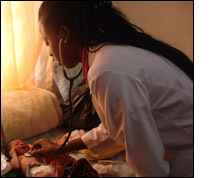 Due to the common lack of prenatal care and as a result lack of anticipatory guidance in Nigeria, I saw many neonates that suffered from neonatal sepsis, likely due to lack of infection control measures in the post partum period. Through my experience in Abuja, I was able to learn that humanity and compassion does not have a face, a language, or race. Through the many children I was able to treat, I realized that what one may consider so small, can make a huge impact on so many people. Practicing medicine in a resource limited setting has made me a better clinician, and has made a huge impact on my future professional goals. Without the assistance of the Benjamin H Josephson fund, this experience would not have been possible, and as a result, I am ever so grateful.